The application form can be download now. Interested community and charitable groups are invited to apply, outlining the details of a project which would use some of the timber and how it would benefit the local community. Applicants will then be advised if they have been successful by the end of May 2019. The application process will be run in two phases, with this phase offering tree trunks to Borders-wide groups from land we own. 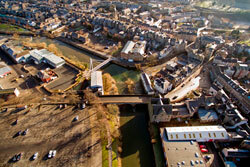 To date, the site clearance and tree felling works have been undertaken on Mansfield Road, Weensland and the river banks between James Thomson Bridge and North Bridge. In November 2018 when we reviewed the scheme’s progress and re-profiled its programme, a decision was taken to postpone the remaining tree felling works until autumn 2019 to minimise impact on the town’s landscape. “I would encourage community and charitable groups to come forward with their ideas, and to speak to us if they have any queries or need more information to help complete their application forms. The Hawick Flood Protection Scheme will deliver protection from a 1 in 75 flood event to over 900 residential and commercial properties at risk along the River Teviot and Slitrig Water, as well as multiple benefits for the community. Further details on the scheme are available at the website and Facebook page.